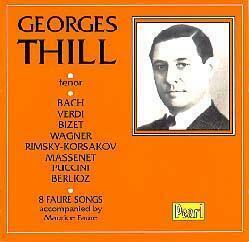 The year 1997 marked the centenary of arguably the greatest French singer of the century, the tenor Georges Thill. Born in Paris in 1897, he studied with the legendary tenor Fernando De Lucia in Naples, which certainly accounts for the fact that Thill is one of the few francophone singers who combines an idiomatic French diction and stylistic sense with a so-called "bel canto" vocal technique, based on the twin pillars of legato and mezza voce. He made his debut at L’Opéra de Paris in 1924 as Nicias in Massenet’s Thais. By the time he retired in 1956 he had performed most of the standard roles of French and Italian opera in addition to several from the Wagnerian operas that he loved so much. His repertory was vast, comprising more than 50 leading roles. He was equally at ease in the works of Bach and Gluck (his "Bannis la crainte" from Alceste and "Unis dès la plus tendre enfance" from Iphigénie en Tauride are required listening) as in the contemporary works of Rabaud, Canteloube and Guinsbourg that he helped to create. His career was centered on Paris (L’Opéra and L'Opéra-Comique) but took him to Covent Garden, La Scala, New York’s Metropolitan and the Colón in Buenos Aires. He even found time to make several films, including Abel Gance’s production of Charpentier’s opera Louise with Grace Moore. Thill’s enormous discography (over 150 titles and several complete operas) reflects not only the diversity of his art but his genius. He was a master both of the lyrical phrase and the voix-mixte (listen to his high C in "Salut! demeure chaste et pure" from Gounod’s Faust) and of the heroic outpouring (as in "Inutile regrets" from Les Troyens by Berlioz). He possessed a luminous voice of rare beauty and homogeneity. In addition to exemplary diction and phrasing, his singing demonstrated a quality all-too-rare nowadays: irreprochable taste. Georges Thill simply had class . . .
Two recordings demonstrate his talent. Pearl (GEMM CD 9947) offers several essential Thill recordings: (Damnation de Faust, Hérodiade, Carmen and Roméo et Juliette) but also numerous debatable choices (such as French-language excerpts from La Bohème and La Traviata and 8 Fauré songs). The accompanying notes are equally suspect — he did not sing only in French! — and as usual on Pearl, the technical reproduction will not please everyone. The choice of excerpts on the Bongiovanni label is not only more representative of Thill but the transfers are more faithful and less troubling than on Pearl. This Thill recording is part of an interesting and precious series of historical recordings. Indeed the whole series "Il mito dell’opera" continually surprises by the excellence of its presentation and its vocal content.